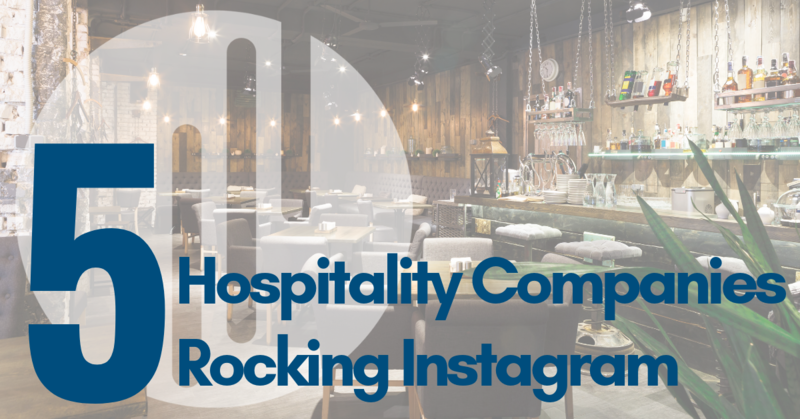 We are excited to spotlight five companies in the tourism and hospitality industries that are leading the way on Instagram! With over 6,000 properties in 122 countries around the world, Marriott has a large global audience of existing and potential employees to connect with – and a great story to tell! 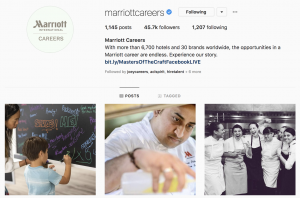 Marriott effectively targets their global audience by leveraging their significant storytelling potential with a careers-specific social media presence. What We Love: Their social media showcases images of Marriott teams around the world, connecting with multiple markets and featuring their beautiful properties. Images represent a variety of themes, with one clear common thread: fun! You know that just by looking through their feed wherever you end up with Marriott, you’re going to have a good time. The competition for talent in the hospitality industry is fierce. Companies have to get creative to attract the best people. Cactus Club is a great example of getting creative to reach and engage their audience, using social media to differentiate themselves. Through their imagery, they have found a balance between their corporate style and the individuality of their team members. What We Love: Cactus Club engages their audience on multiple levels. Both on the candidates and customers are engaged through events, contests and real life human content. Cactus Club uses new features like Instagram stories to showcase their behind-the-scenes life. They have cultivated their feed to include a combination of polished and in-the-moment photos. This creates an overall spirit of authenticity (and fun!) in their feed. 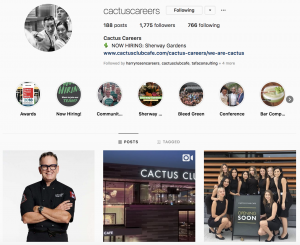 Paired with on-brand captions, #wearecactus hashtag, and the cactus emoji, Cactus Club has built a winning social media strategy! 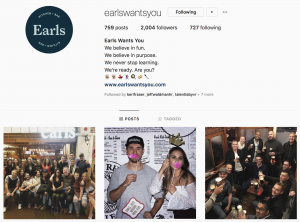 When it comes to social media in the restaurant industry, Earls was an early adopter of digital employer brand strategies. To date, their ‘Earls Wants You’ tagline is one of the most widely recognized slogans in the industry. Earls has built a strong culture, with employees aligned with their core values. They do a great job of featuring this through their social platforms and digital content. To help keep their content fresh and authentic, they encourage employees to share photos of their life at Earls using the hashtag #myearls. What We Love: Earls has accounts dedicated to their consumer brand and individual restaurants. They have also invested in developing a centralized career social media, creating a channel for their culture to shine. Check it out – it will get you wanting to pull out your resume and run to your nearest Earls restaurant once you’ve scrolled through their feed! Did you know that Whistler is one of Canada’s Top 100 Employers for 2018? As consumers, most of us see Whistler as a weekend destination. 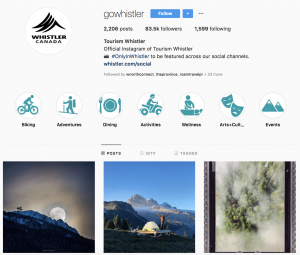 They use social media to show people that Whistler is a great place for both play and work, in one of the most beautiful destinations BC has to offer! What We Love: Their images boast the amazing views and outdoor living of the Whistler lifestyle. This lifestyle is a great incentive for job seekers exploring the job opportunities in the area. For those who like to work as hard as they play, Whistler is the perfect place to be. 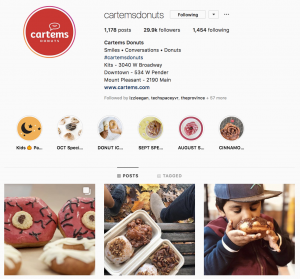 Cartems Donuts is a great example of how to leverage your corporate accounts to also showcase your culture! Cartems doesn’t have a dedicated careers account, but their lively posts show what it’s like to spend time with them as a customer and an employee. What We Love: When it comes to candidate experience, your careers page isn’t the only place potential applicants will be looking. Especially when you’re a business to consumer business! Your employer brand is constantly being communicated through everything your business does. Don’t have the capacity, resources, or desire to build and maintain separate careers profiles? Start by using your company platforms to connect with candidates, showing off what it’s like to be part of your team! Download our Social media Tool to help you get started!